The cowardly brutality of the summary execution of Iraqi President Saddam Hussein has shocked the world. The vengeful and sectarian nature of Iraq’s occupation-imposed puppet government has been proven beyond doubt. No executioner’s hood can conceal its disgrace. George W Bush’s “new Iraq” stands exposed for all to see. The era that has ended is not that of Arab nationalism; it is the era in which the hypocrisy and impunity of US imperialism can be cloaked in lies. The Iraqi Higher Criminal Court that sentenced President Saddam Hussein to death is unequivocally illegal under international and Iraqi law.1 Created by US Proconsul L Paul Bremer, it was never anything but a US-orchestrated puppet court.2 A key aim was to establish a veneer of legality to an illegal invasion of a sovereign state. The catalogue of due process violations that characterised its proceedings stands testament to the impunity with which the pre-written trial outcome was imposed.3 The imposition of a death sentence after an unfair trial is a grave violation of international law and an affront to universal human values.4 US claims about protesting this execution are pure propaganda. It was not Saddam Hussein’s death warrant that Nouri Al-Maliki signed so publicly but his own political and moral downfall along with that of the militias and gangs he is leading. The haste and the glee with which Maliki rushed through the execution exposes clearly the sole division that exists in Iraq, between the occupation and its local lackeys and the Iraqi population and its resistance to America’s murderous agenda. This execution finds its place within an American strategy that at the least seeks to humiliate Iraq and at worst aims to foment mass civil strife if not a wider regional conflict. The criminal Maliki government cannot now be recognised by any government, institution, association or citizen as either a protector of Iraq and its people, or of legality and Iraqi custom. Defeated on the ground militarily, politically and morally, the US-led occupation can only attempt to cow the Iraqi people with atrocities. It is a hopeless policy. Nothing will allow the United States and its criminal partners to impose on Iraq a future that is contrary to the fundamental interests and rights of the Iraqi people. International institutions of law and human rights practice, by their silence or timidity, have not only failed the people of Iraq but also the people of the world. International law is the arbiter and guarantor of world peace. Mandated authorities are tasked to oversee the actions of states and governments and intervene as necessary to protect not only inalienable individual and collective rights but the standing of law as the moral foundation upon which world peace is secured. We demand that governments across the world withdraw recognition and any legitimacy afforded to the current criminal Iraqi government and recognise the Iraqi resistance as the sole representative of the Iraqi people and the continuity of the Iraqi state, its sovereignty and integrity. We call upon all political groups and human rights organisations, along with progressive and humanist intellectuals, to unite to defend peace, international law and justice by defending the Iraqi people and its legitimate representative, the Iraqi resistance. 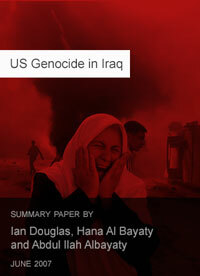 2007 must be the year in which the illegal and murderous occupation of Iraq is brought to an end. 2007 must be the year in which law defends justice, not imperialism, and in which the moral foundations upon which world peace depends are renewed by unseating and prosecuting the war criminals of Washington and London and their Green Zone puppets in Baghdad. Under international humanitarian law, occupying powers under are expressly prohibited from changing the judicial structures of occupied states. See Articles 43 and 55 of The Hague IV Regulations on Laws and Customs of War on Land, 1907; Articles 54 and 64 of The Fourth Geneva Convention Relative to the Protection of Civilian Persons in the Time of War, 1949. See also Articles 70 and 65 of The Fourth Geneva Convention Relative to the Protection of Civilian Persons in the Time of War, 1949; Article 14 of the International Covenant on Civil and Political Rights. Article 14 of the International Covenant on Civil and Political Rights requires that courts be established under pre-existing law. While the International Criminal Court cannot be invoked given that neither the United States nor Iraq are State Parties to the Rome Statute, the principle of extra-territorial jurisdiction is increasingly taking hold internationally, particularly in Europe, with recent cases being filed in Germany, Spain and Belgium. France, the United Kingdom and the Netherlands all have some provision within national law for universal jurisdiction. High war crimes, including the illegal execution of President Saddam Hussein, like genocide and crimes against humanity, are usually covered by extra-territorial jurisdiction where it exists.